When I bought my first computer-based DVR over eight years ago, it was a novelty to be able to record TV on my home PC. The computer could do so much more in terms of scheduling compared to my VCR. I installed the DVR device into my computer, hooked my computer into my TV, and never looked back. But times have changed. The cable companies have encrypted their channels and have made it nearly impossible to use the older computer-based DVR devices. Now with the SiliconDust HDHomeRun PRIME, watching live digital cable TV on any screen in your home is a real possibility. Furthermore, it’s very possible this device can help you eliminate all the rented digital cable boxes you have in your home allowing you to save money on your monthly cable bill. Let’s review the HDHomeRun PRIME and see if it would be right for your house. The SiliconDust HDHomeRun PRIME HDHR3-CC in essence is a cable box that attaches to your home network instead of attaching to your TV. Since this is a computer-based DVR, there must be a host PC running Windows, Mac OS, or Linux which can access the network and perform the necessary functions of receiving, decoding, and transmitting the TV signals. The HDHomeRun Prime has three (3) separate digital cable TV tuners built-in. Each tuner can receive digital cable TV broadcasts in HD (high definition) and SD (standard definition). Like other digital cable TV tuner devices, such as the TiVo Roamio, this DVR requires a CableCard from your local cable company. The CableCard must be the M-Card type and not the S-Card type. M-Card allows more than one tuner to access the CableCard at one time. CableCards are sometimes free to obtain from your local cable company service center. But the average price range is from $2 to $4 with extremes of $10 seen in some areas. The HDHomeRun PRIME will work with just about any cable system provided that the M-Card standard is supported. Since the M-Card is used to decode encrypted cable channels, Verizon FIOS is also supported since Verizon uses similar set top boxes for their fiber-optic phone and TV service. The HDHomeRun PRIME does not work with antenna, satellite, or analog broadcast systems. This is strictly limited to digital cable TV that is decoded using a CableCard. So having a working, paid cable connection is essential. Just like any other DVR, the SiliconDust HDHomeRun PRIME HDHR3-CC uses a hard drive for storing TV recordings; but the hard drive is in the host computer not the TV tuner box. As with those other devices, the number of shows which can be recorded is limited to the amount of free hard drive space available. It’s hard to pinpoint an exact number of shows or the exact number of hours which can be stored. But in general recording SD TV shows will eat up about 1 to 2 GB per hour. HD recordings will consume about 4 to 8 GB per hour. The recording size is given in a range because most DVR software allows for different quality settings. A lower quality will use much less space than the higher quality setting will. But the lower quality video may look a little fuzzy and less defined than the higher quality setting. Both SD and HD have different quality recording settings which is determined by the DVR software. The HDHomeRun PRIME is pretty much self explanatory when it comes to connections. 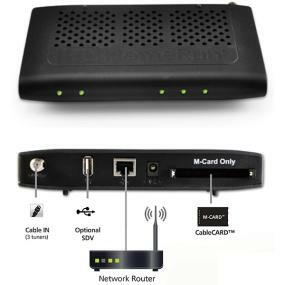 There are just three inputs: power-in, digital cable coax, and M-Card slot. The fourth connection is the RJ-45 Ethernet port through which the HDHomeRun PRIME uses to attaches to a router that runs the home network. Last there is a USB port for connection to a Tuning Adapter for cable TV providers that use Switched Digital Video such as Time Warner Cable. If the cable company in your area uses this type of device, you most likely already have one in your home. As mentioned above, the SiliconDust HDHomeRun PRIME HDHR3-CC must be connected to the local home network through the Ethernet port on the back of the unit. This is a 1000baseT gigabit Ethernet connection. Ideally your router should also support 1000baseT gigabit connections as well for the best results. But 100baseTX networks are also supported. While those terms might look confusing, they really aren’t. Check your router manual or the manufacturer’s website to see which types of networks your router supports. Remember you want 1000baseT if you can get it. Otherwise 100baseTX will do for now until your next router upgrade. The HDHomeRun PRIME is a UPnP device (universal plug and play) which allows it to connect to your UPnP enabled router with no configuration. Once connected, other devices on the network will see the HDHR3-CC as a network-based TV device. This 3 TV Tuner DVR also is DLNA certified (digital living network alliance). DLNA simply is an industry standard that allows for the sharing of music, photos, and videos between devices regardless of the manufacture. This is a very important standard in the modern home where everything is connected. There can be several other DNLA certified devices on your network. If you want 9 TV tuners, you can add additional HDHomeRun PRIME or other SiliconDust HomeRun TV tuner devices. Of course, your home network may not be able to support the simultaneous streaming of 9 separate shows. But the ability to add more devices is there. Now that we have all the hardware specifics out of the way, it’s time for a review of the features. Since this is a basic digital cable device, there are no built-in applications or services. 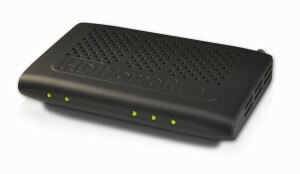 The HDHomeRun PRIME simply transmits the TV broadcasts over the home network. But many things can be done with this simple CableCard device. Most important is the simultaneous streaming of live TV for up to 3 TV broadcasts at once. These three shows can all be going to one computer for recording or can be streamed to any number of devices for live TV viewing. It is possible for more than one device to view the same TV tuner as I have learned through my research. Of course the TV tuner is tuned into only one show and all devices must be viewing that show. 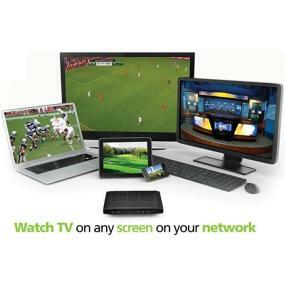 The HDHomeRun PRIME’s 3 TV tuners can be used by a PC running DVR software. Windows Media Center is probably the best DVR program suited for this task since it supports DTCP-IP content protection for viewing premium channels such as HBO, ShowTime, etc. Through WMC, full DVR functionality is also possible. The DVR can play, pause, record, schedule, and watch live TV. And the integrated electronic program guide is nearly as good as that available on TiVo. More important, encrypted premium channels are viewable through WMC running on the host PC. Encrypted premium channels cannot be streamed to other devices that do not support DTCP-IP due to copy protection set in place by your cable operator. Some operators are very strict while others are not. And sometimes there is a great difference among different areas of the country for the same cable company. In other words, while Comcast in Pittsburgh may allow streaming of HBO to other devices, Comcast in San Francisco may not. Windows Media Center for Windows 7 and 8 are the only versions capable of accessing the premium content on digital cable TV. Windows XP Media Center Edition cannot access premium channels either since DTCP-IP support was not written into the programming. With the introduction of Windows 8, Media Center is not part of Windows any longer. Microsoft decided to save some money and didn’t wish to pay for a license for each copy of Media Center shipped. Instead Media Center is a plugin which has to be purchased separately. Customers using Windows 8 must purchase the Windows 8 Pro Pack in order to get Windows Media Center. People running Windows 8 Pro, must purchase the Windows 8 Media Center Pack. Of course Windows 8 isn’t the only DVR software that can be used. Many very good DVR software programs exist that will do what Windows Media Center can do with the exception of viewing premium channels. Once again, copy protection is the determining factor. Only channels marked as “copy freely” can be viewed and recorded by these other DVR programs. Some of the better known and well supported DVR programs are: MythTV 0.25 or later (Linus/Mac), NextPVR (Windows), BeyondTV (Windows), InstaTV 2.0 (streaming on iOS devices + transcoding on Windows PC), and the HomeRun TV app (Android – SD channels only). Obviously if you are reading this review, you want to watch TV. Watching television from your host PC is fairly simple. With the host PC acting as an HTPC (home theater PC), you need to install the necessary SiliconDust software to enable your computer to access the HDHomeRun PRIME network data. Next you will need to run the setup software that allows you to pair your M-Card with the HDHomeRun PRIME. You will be provided with some numbers by the software. These numbers must be given to the cable company so the CableCard can be made active and paired with your HDHomeRun PRIME. Without this step, the HDHomeRun PRIME will not work. Usually only a toll-free call to your cable company is required. Once the HDHomeRun PRIME is setup and working on your PC, install the desired DVR software. If using Windows 7, Windows Media Center is built-in and ready to configure. Windows 8, Mac OS, and Linux systems will require third party DVR software. Once the DVR software is setup, you should be able to watch and record most all of your digital cable channels in full HD on your PC. As noted earlier, cable company enforced copy protection may limit your viewing to only “copy freely” channels unless you use Windows Media Center. No one wants to watch TV on their computer monitor if they don’t have to. Usually a HTPC will have either DVI or HDMI connections on the back. Plug one of these connections into your TV for HD quality TV. You will need to have the appropriate cable on hand to make this connection since it not provided with the SiliconDust HDHomeRun PRIME. One of the best features of the HDHomeRun PRIME is the DNLA certification. Simply put, any other DLNA certified device can access the HDHomeRun PRIME over the home network without the host computer being involved. So any smart TV, tablet, phone, etc that has DNLA can watch live streaming TV. Also any device that supports DTCP-IP will be able to view the protected premium content such as HBO, Showtime, etc. DTCP-IP is becoming more popular as a means of content protection with more new compatible products being released all the time. If you do not have a DLNA compatible television set, there is another option. A TV can be connected to DLNA device which will receive the streaming video and show it on the TV. The xbox 360, Playstation 3, media extenders, media boxes, and blu-ray players are DLNA compatible. Simply connect one of these devices to your TV and you will have access to the HDHomeRun PRIME. To watch recorded content, you will need to connect to the host PC where the shows are stored. The host PC must be running a media server program which can stream the content to another device. Once again, Windows Media Center is up to the challenge. But there are other solutions as well such as NextTV, if you can’t go the Windows Media Center route. Smart televisions usually have the ability to connect to a media server since they are DLNA certified. If you don’t have a smart TV, then a media extender is required. The best media extenders available are the xbox 360 and PlayStation 3. Each media extender must be registered with the media server first before the extender will connect to the host. But this is a relatively quick and easy process and only involves entering a code on the media server setup screen. The HDHomeRun PRIME has been received very well over the past few years. It is highly regarded as a quality television streaming device with nearly 75% of reviewers giving it a 5-star rating. Nearly 90% of all customers who wrote a review gave the HDHomeRun PRIME a 4- or 5-star rating. Just about everyone comments that the PRIME “just works”. It does what it should do and it does it very well. Most complaints about the HDHomeRun PRIME actually have nothing to do the product itself. Most complaints deal with cable companies and their inability to get CableCards activated properly. It seems that not all cable company employees are created equal. Some employees know exactly what to do when activating a CableCard which gives the customer a trouble-free experience. Other times, the cable company makes mistakes repeatedly causing customers hours and even days of frustration. Unfortunately, this product must use a CableCard so trouble with M-Card activation is a very real possibility. So it pays to do your homework ahead of time. Most cable companies have special toll free numbers setup for device activation these days. It’s better to call this number instead of calling the main toll free number. You will get to the right place eventually; but it may take several attempts and you may encounter many long waits on hold. The SiliconDust HDHomeRun PRIME HDHR3-CC is available directly from SiliconDust for $150. But shopping around online pays off. Amazon recently was selling the HDHomeRun PRIME for $120 with some of their MarketPlace sellers offering units for as low as $110. This is the cost of the HDHomeRun PRIME itself. You may have to incur other costs such as CableCard monthly rental fees, media extenders for non-DLNA compliant televisions, Windows 8 Pro Pack upgrade if you are on Windows 8, and possibly some cables such as a HDMI or DVI cable. My honest opinion is that the SiliconDust HDHomeRun PRIME is a fantastic CableCard TV tuner device. It can allow just about anyone to quickly attach this device to their home network and have the ability to stream live TV to any screen in the house. With the ability to have your HTPC become a DVR as well, it is possible to save on the monthly cable company equipment rental fees. For people who are tech savvy, this would make a great addition to the HTPC setup in their home. Smart television sets will help make the use of the HDHomeRun PRIME less noticeable and more mainstreamed. But when a smart television is not an option, media extenders have to be used. As each piece of technology is added, the process of watching television becomes a little more complicated. It is important to weigh the benefits of such a device against the drawbacks when considering who will be using the television sets the most. Overall, watching television is about enjoyment. Adding the HDHomeRun PRIME should be an enjoyable process and shouldn’t be the cause of tension in your home. Only you know what’s best for you and your family. I think the HDHomeRun PRIME is well worth the price considering it’s added benefits. The question is, what do you think?